Successfully Added DOOGEE X3 Smartphone - Android 5.1, 2 SIM, Bluetooth 4.0, Smart Wake, Gesture Sensing, Two Cameras (Pink) to your Shopping Cart. The DOOGEE X3 is and Android 5.2 smartphone with a compact 4.5 inch screen, 2 SIM cards, 8GB of internal memory, SD card support, Bluetooth 4.0 and more. The first thing you might notice about this particular model is its sleek design and a bright pink finish. While most budget smartphones don’t typically “bother” will the looks, the DOOGEE X3 is a clear exception. 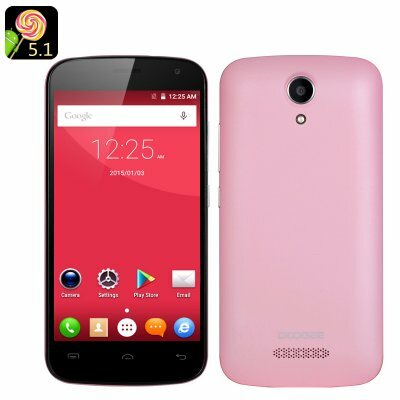 The Android smartphone is colorful, well-designed and has an overall nice feel to it. Even more so, when you learn about its functionality. The smartphone is powered by the MTK6580 Quad Core CPU and comes with Mali-400MP GPU for smooth operation and efficient gameplay. It runs Android 5.1 and lots of cool apps and games await your visit to the Play Store. With two cameras and two SIM cards, the smartphone is set up for great connectivity as well as entertainment. Go ahead and snap those selfies – and instantly share through your favorite social media apps. Two more nice features go well with Android interface: Smart Wake and Gesture Sensing. Check them out – Smart Wake gives you instant access to favorite apps from the locked screen, while Gesture Sensing lets you control certain phone functions with just a wave of the hand.